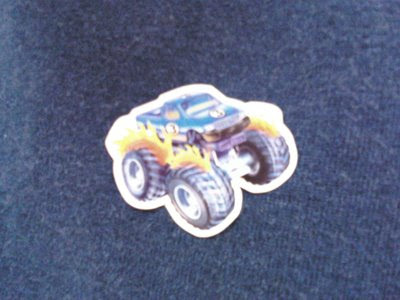 When you're the father of a 3-year-old boy, it's quite possible that you could go to work and not notice for over two hours that you have a blue monster truck sticker on your chest. "When you're a Dad, you're a Dad all the way, from your first cigarette, to your last dying day!" And that song is true, with or without the cigarette. When I got home, T. said "I almost posted a comment with the lyrics to Karma Chameleon to your blog!" So I guess I wasn't the only one! How 'bout the other day when you had a green foam heart sticker with "BFF" written on it right smack in the middle of your back?